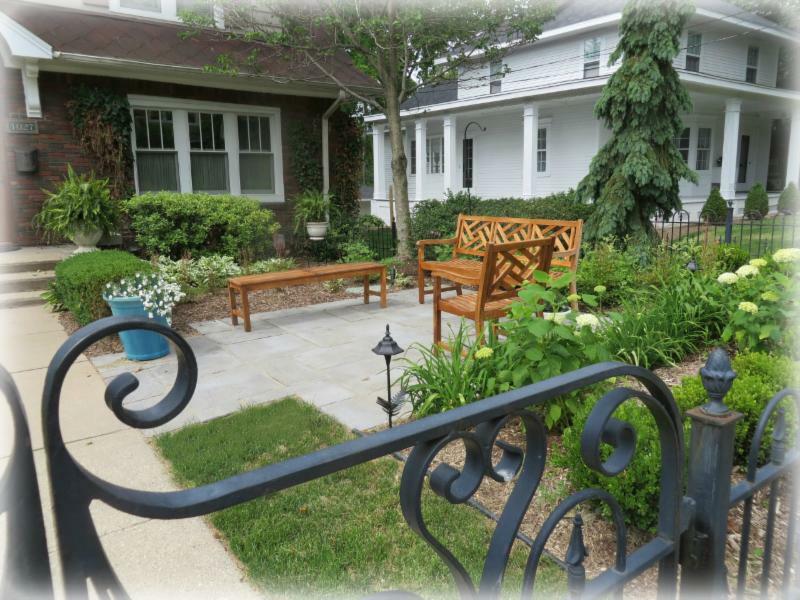 Blog | Page 3 of 3 | Serene Surroundings, Inc.
Urban living often times leaves homeowners with the same problem – How to make the best use of limited yard space? Living in a residential neighborhood does not mean a homeowner must settle with the narrow front lawn of mostly grass and the standard barrier fence around the backyard. The right designer can make even the smallest space look spacious. Here are ten design tips for those looking to widen and extend their outdoor living space. Place warm colors such as red, orange, yellow, and pink near the entryway and place cool colors such as blue, green, and purple away from the entryway. Warm color attracts the eye’s attention, so it should be incorporated through flower beds and planters near the front entry. Additional color can be added by painting the front door a warm color or installing a color paver brick on the entry or around the facade. The cooler colors blend with the surroundings such as the sky and grass, so they should be positioned secondary from the entry. Cool colors are best by property fences and outer areas of the landscape. Evergreen bushes, perennials such as blue hydrangea, and green ground cover are examples of these cool colors. In a smaller yard consider planting taller, slimmer trees and dwarf tree varieties instead of larger, rounder canopies. For a small space, consider adding levels. This works great for confined spaces. The levels can be as simple as a raised patio and tiered planting beds with seat walls. Another leveling idea is to elevate the living area while creating steps down to an additional living area such as a sunk in paver fire pit. Divide the space to create more areas. For example, create an inviting sitting area with a couple of lounges or a swing and draw the eye across the landscape by adding a winding path. Further divide the landscape by adding additional beds and garden areas around trees. This can transform a plain, small front or backyard. If the space is small and all grass, it tends to close-in even more. Try to do a flip-flop. If the space is all grass then add pavers, and if it is all pavers then add grass. This concept works together with dividing the space. When designing for a smaller space, lay pavers diagonally. A diagonal path tricks the eye and creates the illusion of an expanded space. This can be true for paver walks and paver patios. Diagonal pavers on a patio open up the space. 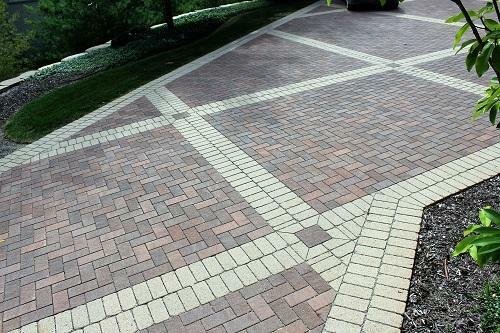 Use linear perspective when adding pavers that must run vertical or horizontal from the house without a curve. It is the same as the very popular subway tile concept except with pavers. 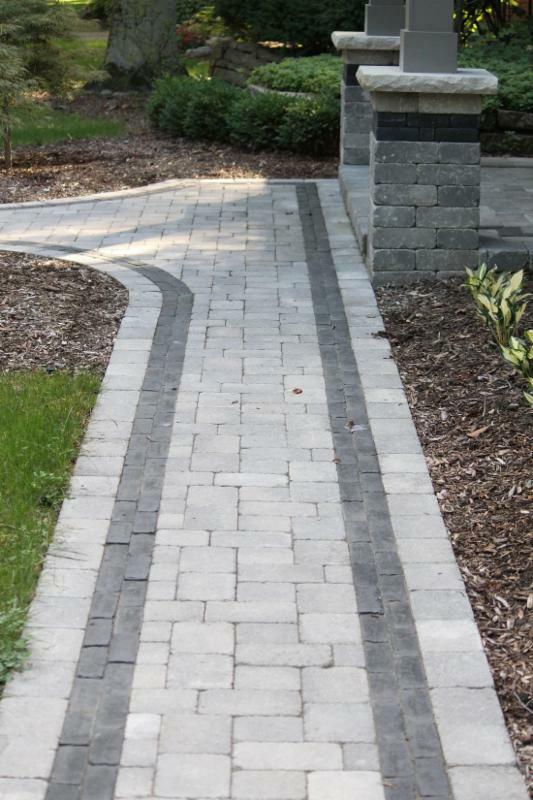 Long, vertical pavers running the direction of the path make the space appear to continue further than in reality. Use a dramatic focal point to draw attention away from the sides of a narrower space. 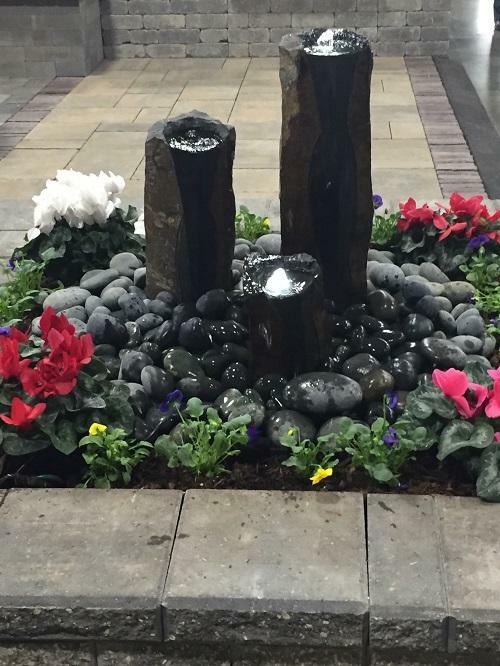 A focal point can be a water feature, garden trellis, pergola, custom screen, or even a birdbath, mural, or sculpture. If possible, avoid installing a fence around a smaller yard. Not having a fence will make the space appear much larger. If there is a chain link fence, try masking it with climbing plants and/or planting green in front. The green screen will pull the eye from the grass and create an illusion. 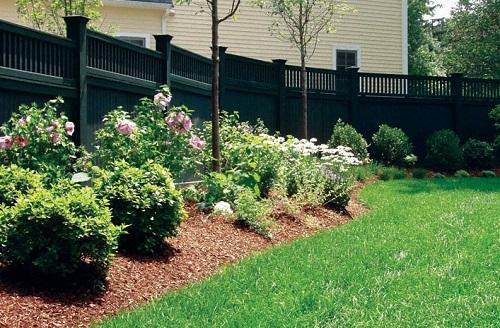 If the fence can be painted, consider a darker color such as gray or even black. This detracts attention from the border of the property whereas the white fences tend to draw attention to the edge of the yard and enclose the space even more. 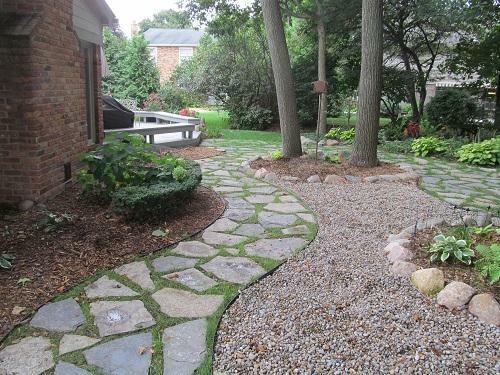 Use a winding path through a garden walk area or as an approach to an entry. This can be done with flagstone or cut pavers. Avoid straight paths in small spaces. Elongate the line by curving it and creating a longer path for the eye to follow. If you would like us to widen your narrow yard, call (734) 416-9062 to speak with an Account Manager. We can help you to plan your next project! 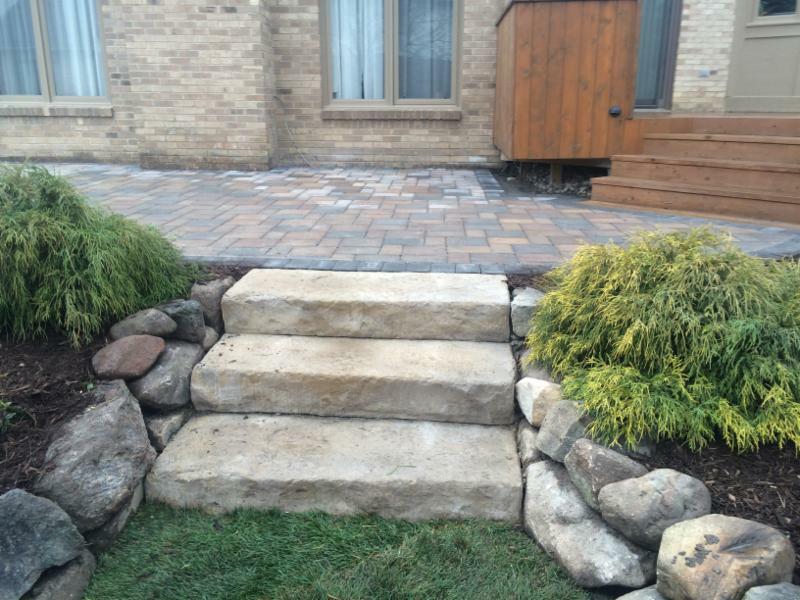 Our professional designers and expert team will transform your landscape into something to be admired. Spring Window Cleaning Special – Call Today! Welcome Spring – Let us do the work, call us today! Welcome to our new company website! The Serene Landscape Group website offers valuable tools for both prospective and current clients. The detailed service pages include pull down menus with detailed information about services and programs. The gallery showcases specific projects side by side so it is easy to compare design ideas and options. We also offer a customer online pay form and a customer email form. Our blog will be updated with both company news and industry specific articles about landscaping, lawn care, gardening, and more.